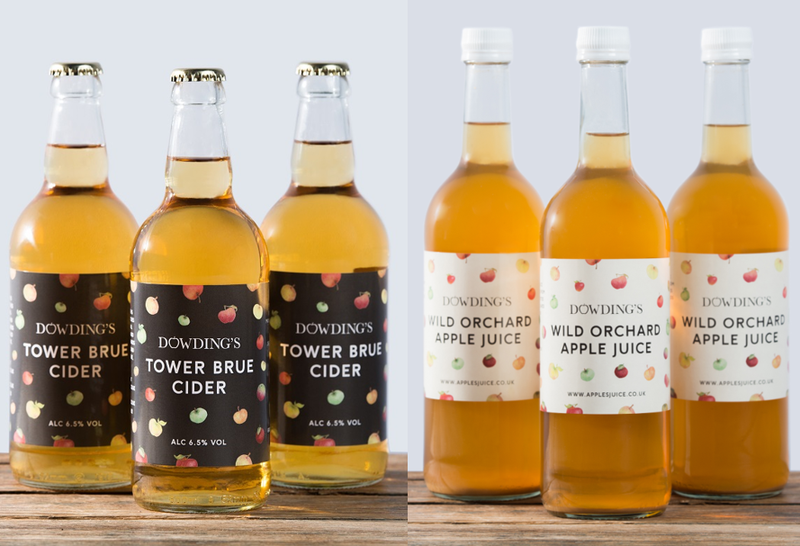 The Bridgwater Food & Drink Festival is a large gathering of incredible artisan producers Dowding's will be there with apple juice! Come and see the options we have available, taste the juice, and enjoy the day. I'll be in Swindon for three whole days at the MacArthur Geln shopping centre where they have a mini food festival stop this is going to be a great opportunity for the people of Swindon to indulge in some excellent apple juice and cider! It is on Kemble Drive SN2 2DY. 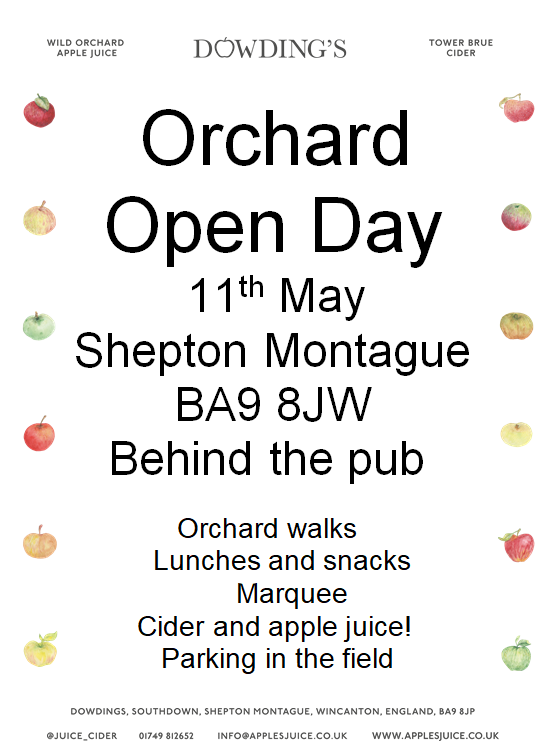 There will be an open day in the orchard on 11th May. Hopefully we will have a lovely sunny dry day but this is UK and nothing can be taken for granted stop and prepared for everything. and, not least, drink some excellent apple juices or ciders. plus, the opportunity to take lots of them home. The event will be adjacent to the orchard, which you can access from the crossroads adjacent to the Montague Inn. There will be car parking on the field. Dogs will be very welcome, but they must be kept on a lead and not unruly. Dowdings will be at the races, just as for the same night in 2018 when we had a cracking evening’s racing with lots of happy cider (and a few apple juice) drinkers to entertain. One happy customer, Robert, emailed this a few days later……”I bought a case of a dozen Tower Brue ciders from your stall at Wincanton Races on Thursday evening (I believe the last one!). It must be the best artisan cider that I have ever tasted and I would like to say thank you very much. Keep up the good work! Fantastic opportunity to come and get stocked up with some excellent cheese and ciders…..and other things too! Come to Bruton to the Godminster shop near the church. 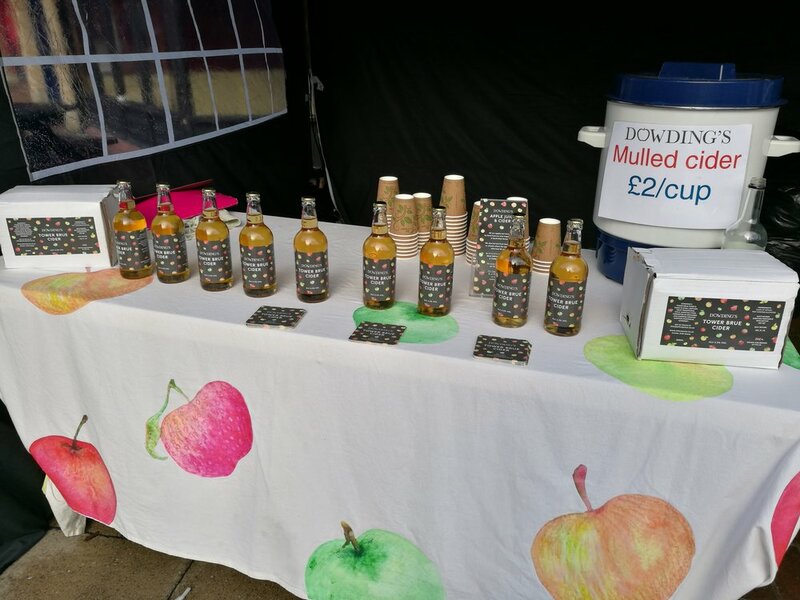 Dowdings will be at the market, as usual, offering wonderful apple juice and ciders. Looking forward to meeting many old and new customers. Dowdings will have their usual stall at this festival, as seen often in Shaftesbury. The snowdrop festival runs for 2 weeks. Dowdings will be at the Gillingham parade when the Christmas lights will be switchedon. We will have our range of apple juice, ciders and mulled cider. Come, see, taste, drink, buy and enjoy! You should come to this amazing show - where the best cheeses in the country come to be pitted against each other. 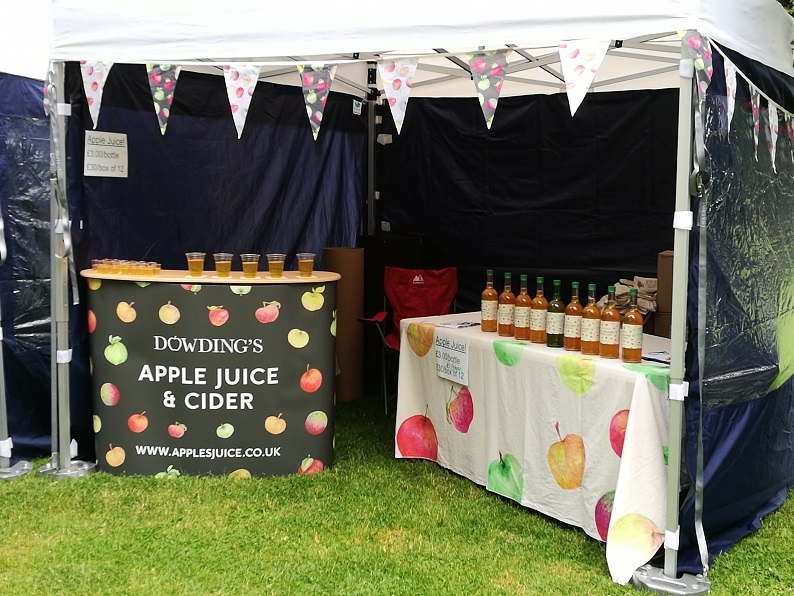 Dowdings will be in the food and cheese tent with loads of cider to match the cheese, or apple juice to quench the thirst. There will by then also be apples from the orchard to buy! 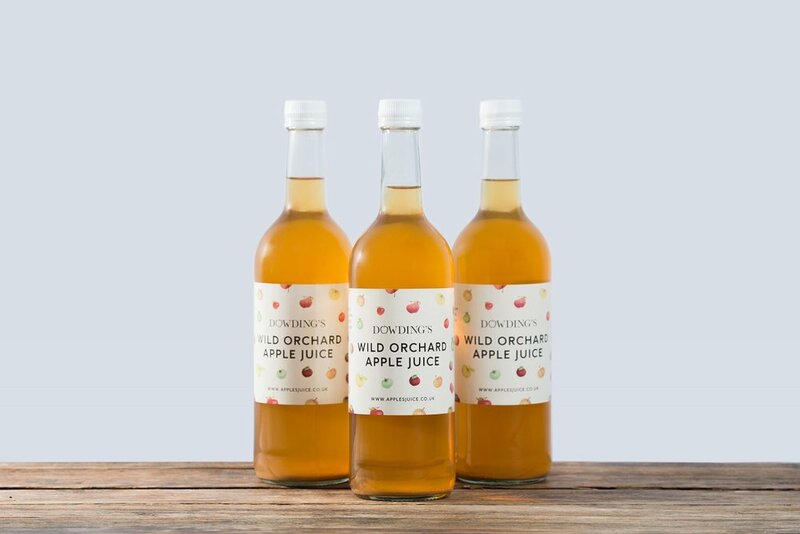 My wonderful apple juice and cider will be at the Mcarthurglen Shopping centre all weekend for their food festival. On Sunday 19th August the bustling Mid-Somerset Show, one of last "true" rural shows, will be on at the showground. Come and join the fun, and have some apple juice and cider to take home or drink on the day! 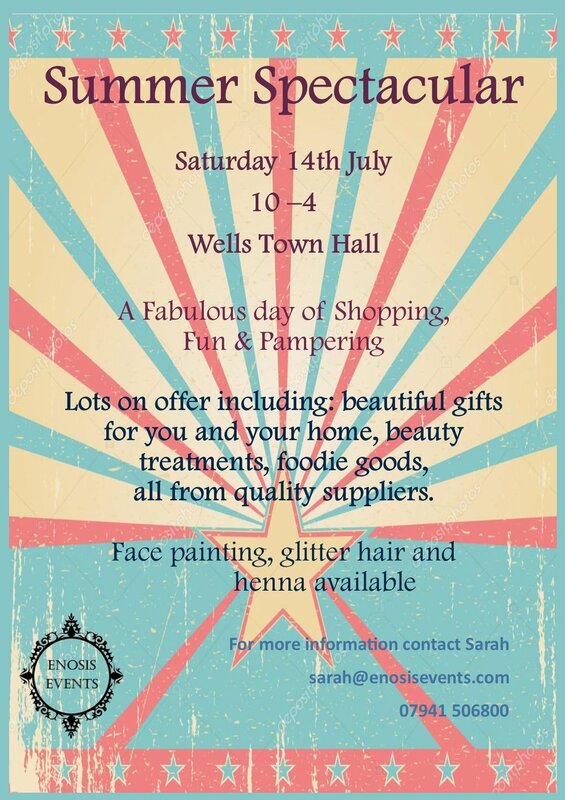 Dowdings will be in Nunney on Saturday 4th August. 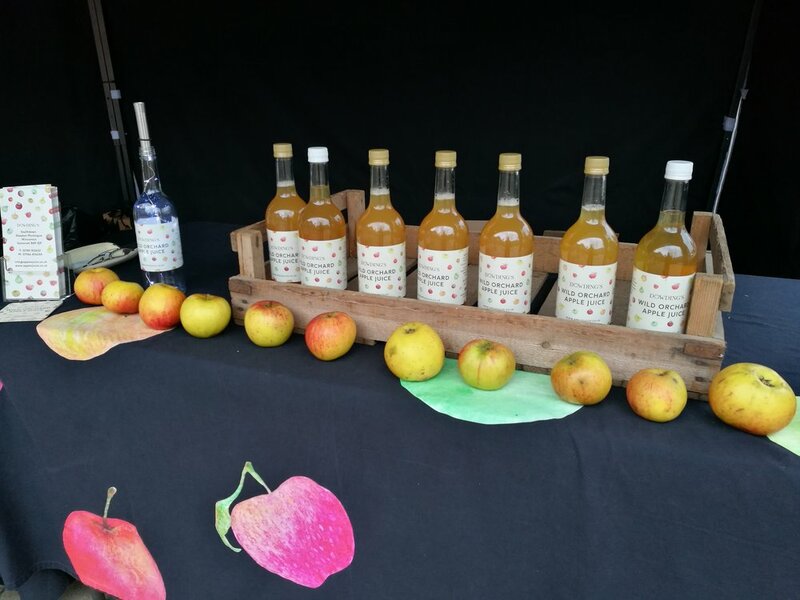 Come and find wonderful Somerset apple juice! Oh.....and we will tell you all about cider as well. We will be at Wells Market from 10-4. This is the same day as the successful town centre market. We will be in the Town Hall with lots of apple juice and cider to drink there and then, or take away to enjoy later. This should be an excellent festival showcasing some wonderful food & drink with a lot of gardening. We'll be there on all three days in the convivial palace surroundings. Dowdings will be at the Ansford School Spring Fair, from 11-4 on Saturday. Come and get some great apple juice and cider! I am going to be a new arrival at this fantastic street market, on 6th January. Come and get the best apple juice and cider - and there will be mulled cider! 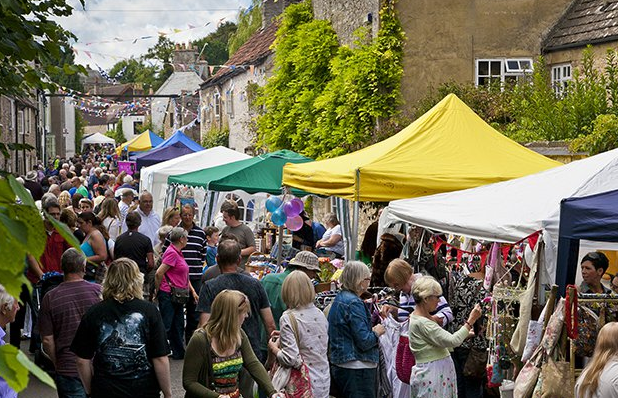 The annual Christmas Street fayre in Bruton will be on 6th December from c. 5.30 to 9. Come and drink with us, and buy to take home, or order for delivery. 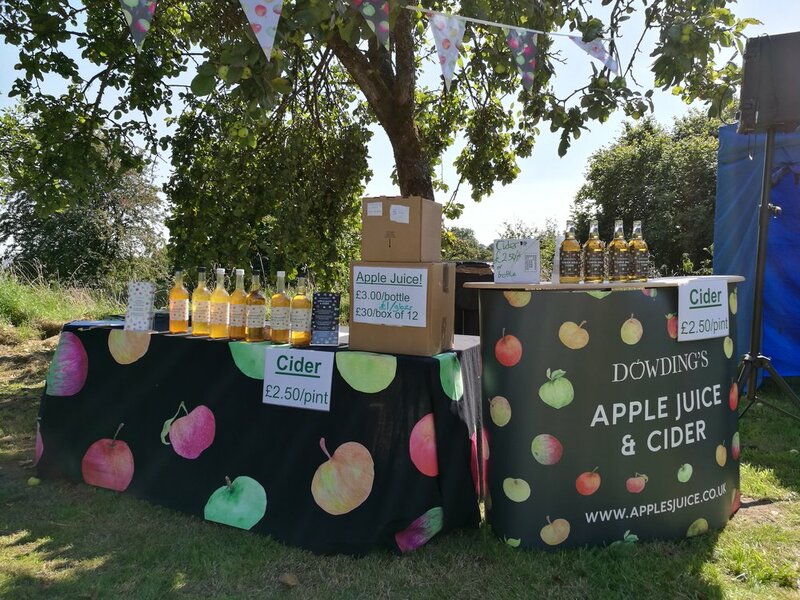 We will be in the Quedam with a pitch selling you lots of lovely apple juice and cider. As we will be right beside the car park it will be easy for you to take away! Our cider will be available as bag-in-a-box or in bottles (from 1 to 12!). The apple juice will be in bottles (including cases of 12). We will also be able to offer you some lovely mulled cider or apple juice. We will be operational from c.10a.m. - 4p.m. each day although on Thursday's we'll be there late until 7pm! Dowdings will be at the Yeovil College "Victorian" Fayre, 25th November from 10-3, helping celebrate their 130th anniversary! A great chance to load up with juice or cider to give to people over Christmas. Or just keep for you and your family! Appearing at Norton-sub-Hamdon primary school for their Christmas Fayre, from 1-4.30 on 11th November. Do come and find me!